1. Heat 1 tbsp of the oil in a large saucepan and cook the onion, celery and thyme for 5 minutes until softened. Add the fresh mushrooms, cook for 2 minutes, then stir in the stock and dried mushrooms. Cover and simmer gently for 20 minutes. 2. Meanwhile, preheat a ridged griddle pan and cook the slices of bread for 1-2 minutes each side until bar-marked. Rub the toast with the cut surface of the garlic, drizzle with oil and sprinkle with parsley. 3. Remove the soup from the heat, discard the thyme stalks, then using a stick blender, whizz until smooth. Divide among serving bowls, drizzle with the cream and serve with the garlic toasts on the side. 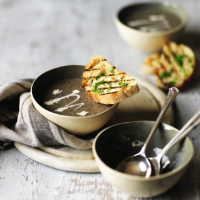 Try swapping the parsley for fresh tarragon – its aniseed flavour works really well with the mushrooms and cream.